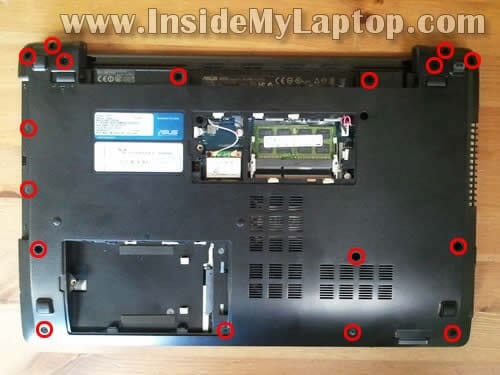 In this guide I explain how to diassemble an Asus K53U. STEP 1-4: Accessing and removing the memory modules, hard drive, DVD drive and wireless card. STEP 12-16: Removing the palmrest assembly. Accessing the CMOS battery. STEP 17-21: Disconnecting and removing the motherboard. STEP 22-24: Accessing and removing the cooling fan and DC power jack harness. 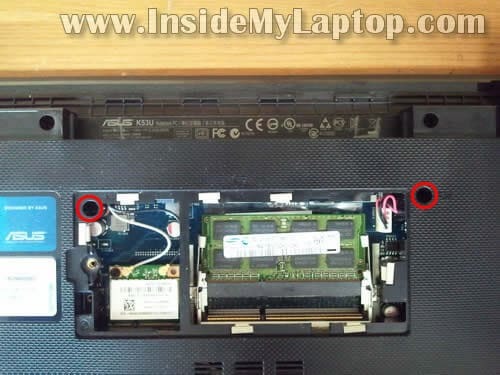 By the way, in the second guide I’ll explain how to remove and replace Asus K53U screen. OK. Let’s take it apart. Make sure the computer is turned off before you start. 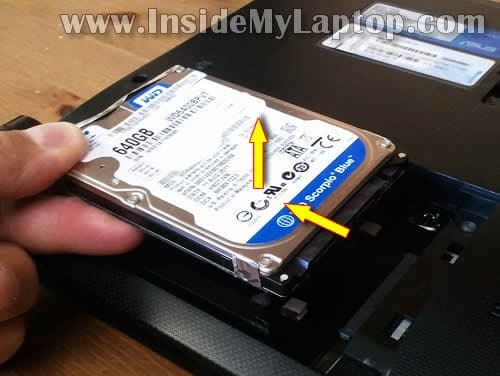 Remove two screws securing the hard drive and memory covers on the bottom. Under those covers you can get access to the hard drive, wireless card and two memory slots. In my Asus K53U I found only one memory module installed. 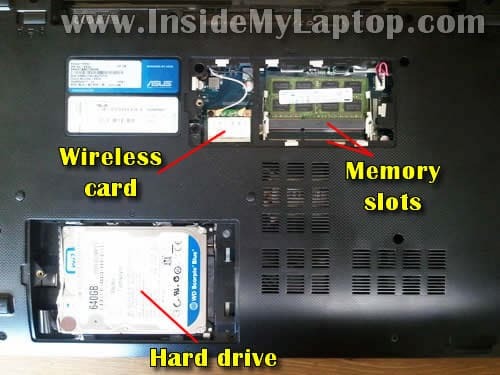 I’ll leave the wireless card and memory module connected to the motherboard. 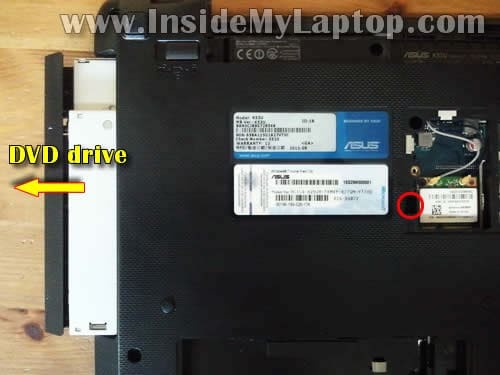 Asus K53U has a regular 2.5″ SATA hard drive installed. 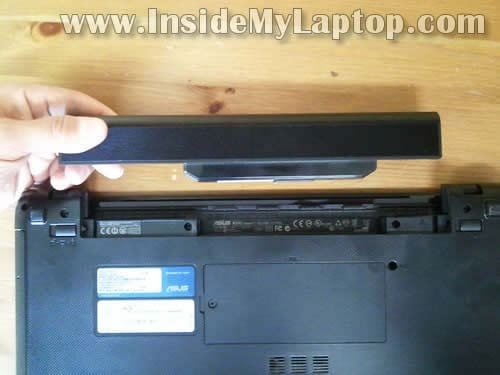 There are three spring loaded latches securing the keyboard on the top. Push on the latch with a small screwdriver. 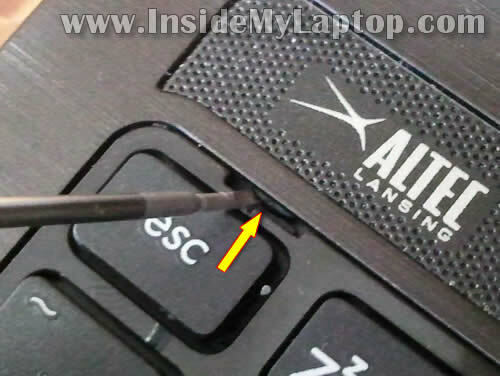 When the latch pushed in, the keyboard will lift up a little bit and the latch will not move back into the locked position. 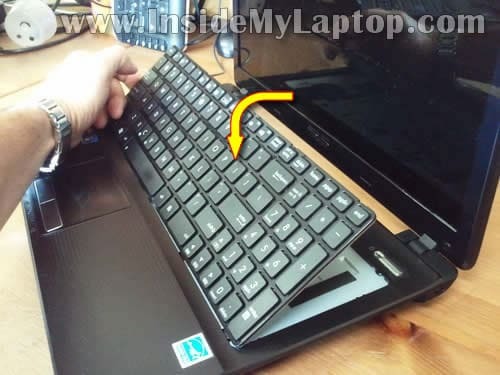 Now you should be able to lift up the upper side of the keyboard and turn it upside down on the palmrest. 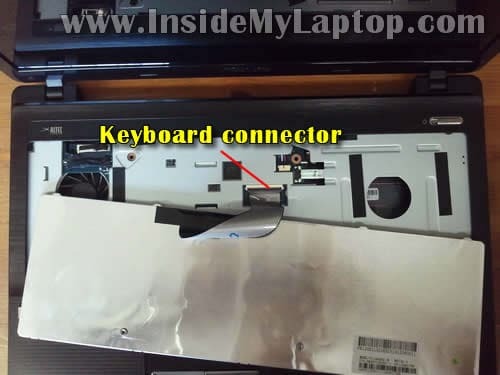 The keyboard connector has to be unlocked in order to release the cable. 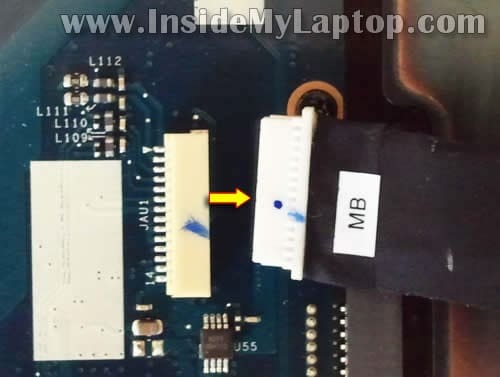 In the following two steps I show how to unlock the connector and remove the cable. Remove three screws securing the palmrest assembly. 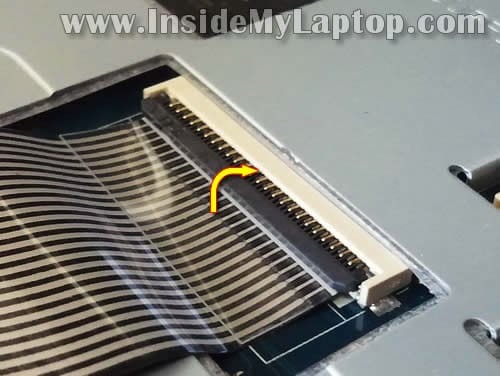 Disconnect the power button board cable (upper arrow) and touchpad cable (lower arrow) from the motherboard. 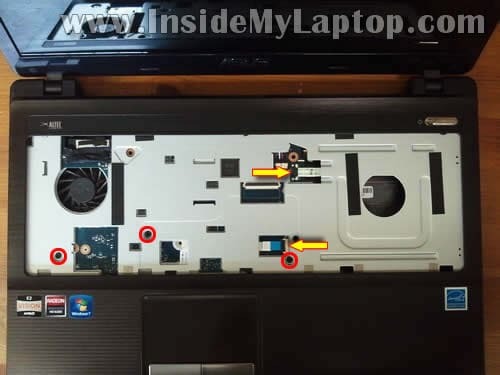 You’ll have to unlock the touchpad cable connector same way you unlocked the keyboard connector in steps 9-10. 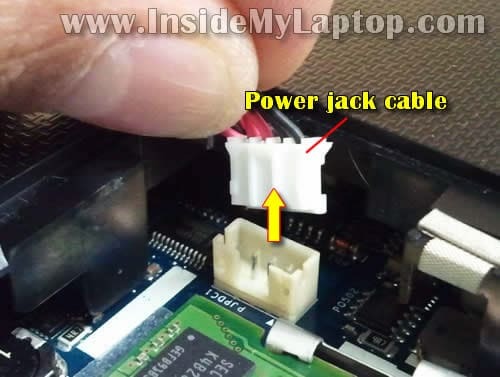 Here’s how to unlock the power board cable connector and remove the cable. Carefully slide the white cable retainer to the right about 1-2mm. Do not apply to much force! The retainer must remain attached to the connector base. On the following picture the connector shown in the UNLOCKED position. As you see, the retainer still attached to the connector. 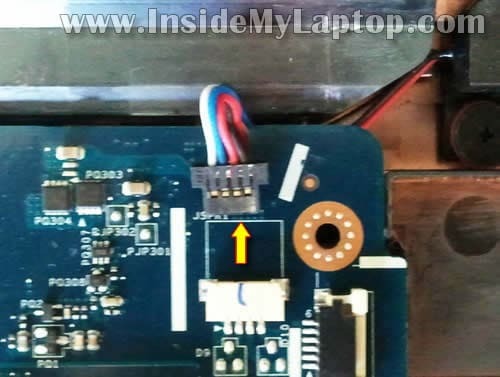 On the bottom part of the palmrest assembly you can access the power button board and touchpad. 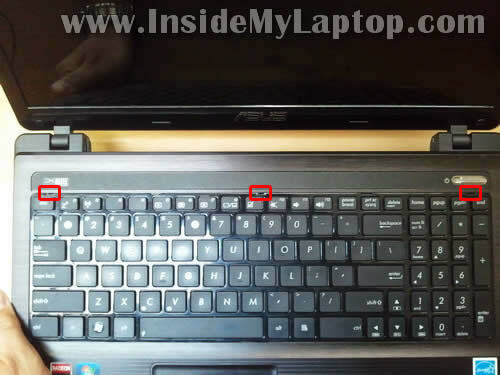 NOTE: the left and right buttons are not part of the touchpad. In Asus K53U both touchpad buttons soldered to the motherboard (you can see them on the next picture). 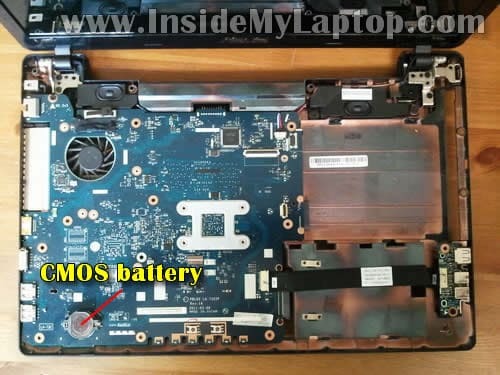 When the palmrest assembly removed you can access the CMOS battery. It’s a regular coin battery which can be easily removed and replaced. 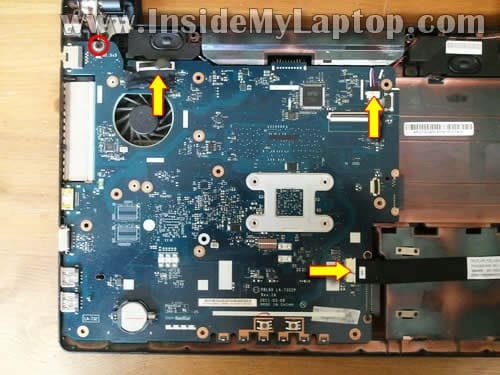 DISCONNECTING AND REMOVING THE MOTHERBOARD. 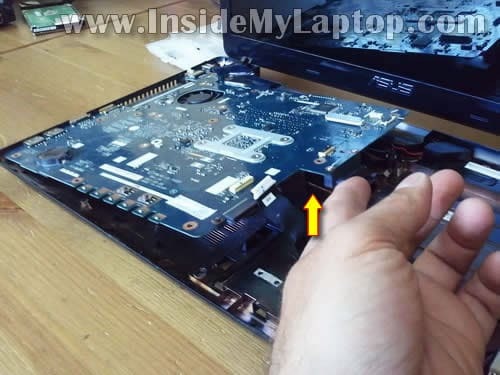 In order to remove the motherboard it’s necessary to disconnect the power jack cable and wireless antenna cables first. Unplug the power jack cable. 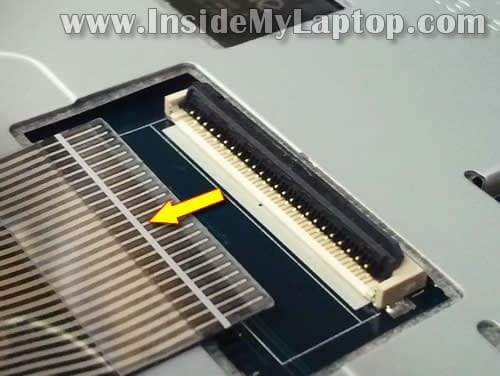 This connector located on the bottom close to the memory module. 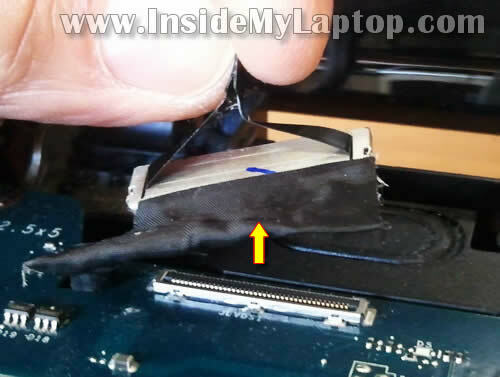 Disconnect the video cable, speaker cable and USB board cable from the motherboard. The speaker cable has a regular male-female connector. Unplug the speaker cable from the motherboard. 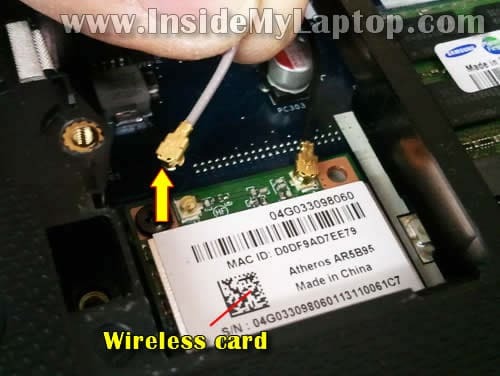 Lift up the video cable connector by the black belt on the top and disconnect it from the motherboard. 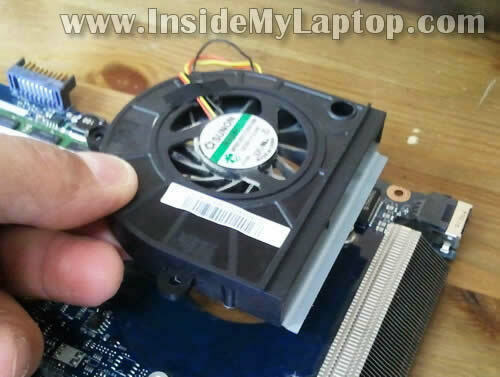 The cooling fan is mounted on the bottom part of the motherboard. 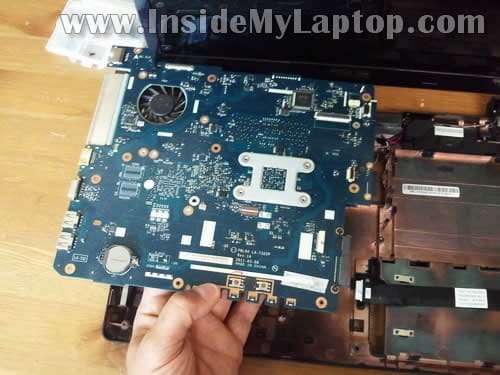 Yes, it’s necessary to remove the whole motherboard in order to access and replace or clean up the cooling fan. Disconnect three screws securing the fan to the motherboard. The DC power jack harness mounted in the upper left corner of the base assembly. After the motherboard removed, the DC jack harness can be easily accessed and removed. FYI – the touch-pad cable connector in step #13 also has a 90 degree swiveling latch that should be ‘flipped’ up before disengaging the cable, and conversely, flipped ‘down’ upon reassembly. I found this out quite by accident during reassembly, but the cable would not have gone back without the latch in the open position! Otherwise this was a HUGE help in fixing our laptop which was not connecting to the power supply because the plug receiver had been pushed back too far into the case, and would not connect. The repair I made was simple, I did NOT wish to glue the socket into the case out of concern that if it was still ‘broken’, I’d have to replace it…which would be impossible if it was glued in. So, I cut a small block of wood: 0.3″ x 0.8″ x 0.8″ to uses as a brace between the rear of the connector and the metal hinge, and reassembled everything, and it works just fine! Thanks for the guide, donation made! FYI – the touch-pad cable connector in step #13 also has a 90 degree swiveling latch that should be ‘flipped’ up before disengaging the cable, and conversely, flipped ‘down’ upon reassembly. This is correct. I didn’t mention how to unlock the touchpad connector because it’s same type as the keyboard connector. Well… I just added it to the guide so there is no confusion. Thanks for the guide, donation made! 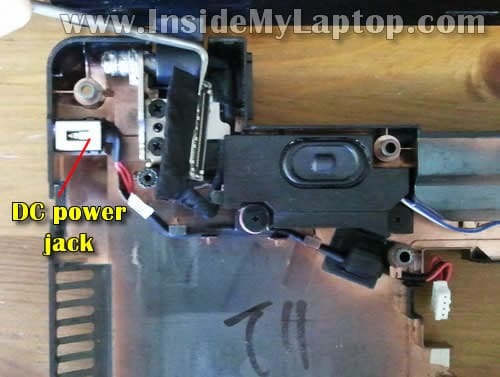 hi i have same problem as phil ozell, DC power jack pushed back into case, my question is do i have totally dismantle the laptop to repair this or can i leave some part in place, thank you. Can you help me to find the motherboard for this model ASUS K53U-SX191 AMD Dual-Core E450. In answer to Dave Horrocks’ question, you only need to go as far as step 15 to access the DC jack. 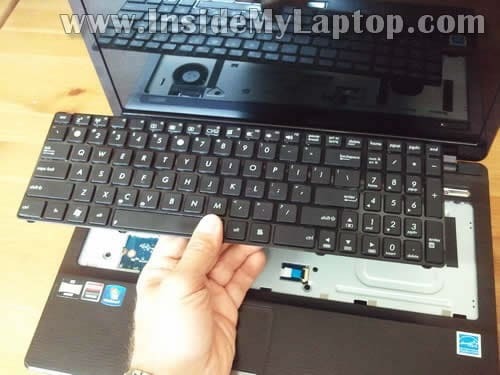 Also of note: the keyboard on my girlfriend’s laptop had 5 latches rather than 3 and was stuck down at the right hand side, it required a bit of force to remove. Does anybody know how to dissasamble ASUS B50A ? 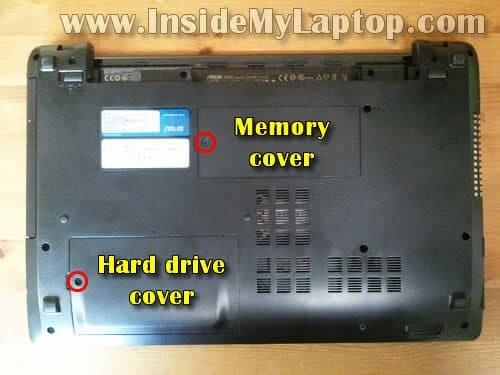 I`m stuck on removing palmrest assembly ( upper cover ) ? hello awesome guides here. Just wondering is there a guide for a asus k53s ?. it should be pretty similar to this no??. I have a A53U-ES21, and I’m about to open up the laptop to fix the power jack. In step 12’s image, I don’t see the top most screws by the screen hinge. Is it under the hinge? Is the hinge covering a screw because even in the image I don’t see where a screw could be and I definitely can’t see it on this model. thanks bro it help me a lot !!! 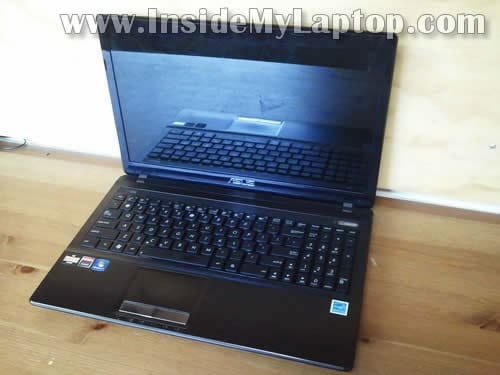 i have asus k53u – cpu c50 2gb 6250 gpu hdd 320 !!! Thank you for this guide. 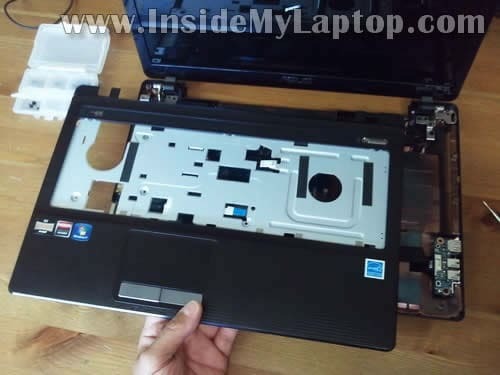 Can you answer: K53SD disassembling like K53U? Cannot tell for sure. It’s a different model but disassembly steps could be very similar. You cannot replace the graphics card or CPU. Both built-in into the motherboard. Hi. Thanks for tutorial, was really helpful. 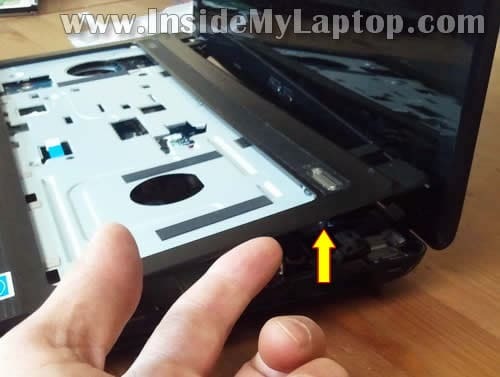 After I’ve changed bottom of the case, my touchpad wont work, small black connector fell off, so I thought its because of that, but than my touchpad buttons is not working, and they’re not connected to the actual touchpad. Does anyone have an idea what might be a problem ? Hi. Thanks for this helpful tutorial. I am replacing my palmrest and bottom cover since they both are broken where the hinges attach. 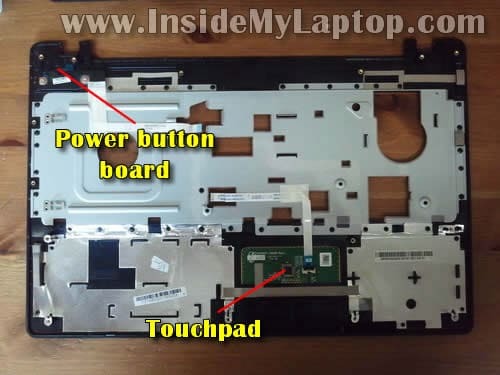 How do I safely remove the touchpad circuit board from the palmrest without damaging it? It appears to be attached with a very strong adhesive. You can try heating it up with a hairdryer or heat gun. It should soften up the adhesive and make it easier to remove. Be careful not to melt the plastic. I believe the touchpad is glued to the palmrest cover. You can try heating it up with a hair dryer. It will soften up the adhesive tape and make easier to separate the touchpad from the old palmrest cover. The heat worked fine but will use as a spare. Knowing the person who owns this PC, it was better to spend $12.00 and get a new one. Hi! I have just used this guide to install a new DC! Was quoted nearly 200 pounds my a laptop repair company because apparently the motherboard was going to be damaged! Ha ha ANYWAY…. I’m thinking of upgrading the ram from 2gb so I can play Minecraft on it… Any tips?? Have no idea where to get the ram from. You will need DDR3-10600 RAM. You can buy it online. I believe this model (Asus K53U) can handle up to 8GB of RAM total (4GB RAM module per slot). I have dismantled the cover, but it looks like I need to get into the base to replace the hinge – does anyone know if this is a total dismantle job or is the hinge base easy to access?